Hi lovies!! I decided to spice up my mug collection and had to share with you sweethearts!! Coffee and tea are part of my day…every day!! My husband showed me a video this weekend of DIY watercolor mugs and I just had to try. I’ve been told to rest inside while I wait on my daughter to be born the next few weeks. So what better time to try out Pinterest ideas!! While investigating how to do the watercolor mug, I found some other techniques. These were my favorite! They are fairly easy to make and there’s a ton of ways to get creative on your own. My husband picked up some mugs from the Dollar Tree. They are basic colors and a dollar! He even used a 40% off coupon that all craft stores offer on the Mod Podge. ***Make sure you buy dishwasher safe Mod Podge for all these projects!!! I cleaned my mugs with rubbing alcohol before starting any project. Do not apply any glue and so on to where your mouth will touch. This just may be my favorite. Considering all the colors of nail polish I have, I will be making more of these! Fill a bowl with very hot water…. 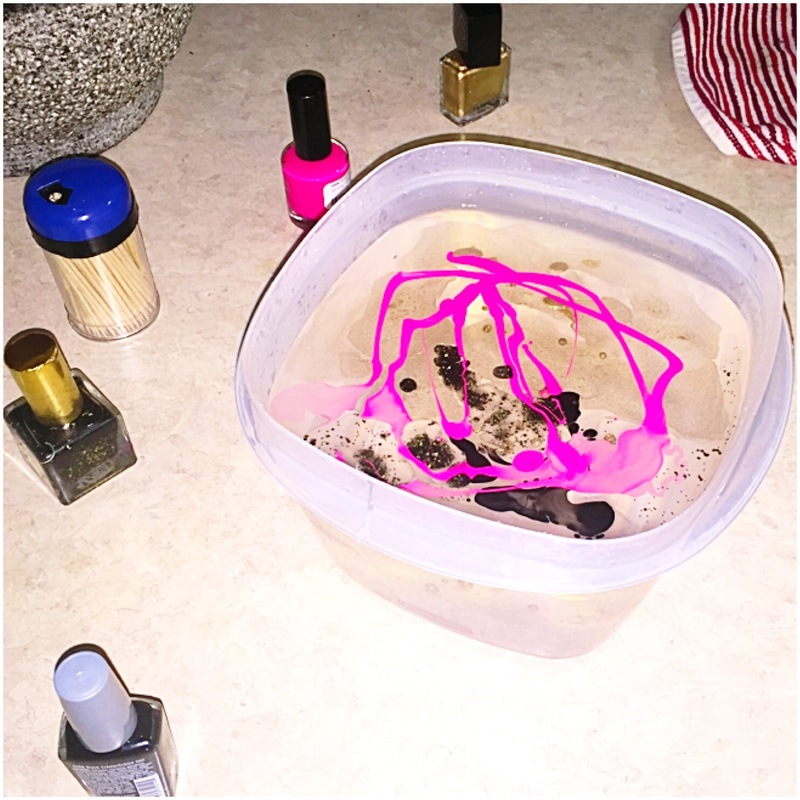 Drop in or swirl in the colors of nail polish you would like to use and act fast!! You don’t want the color to dry up or fall to the bottom! 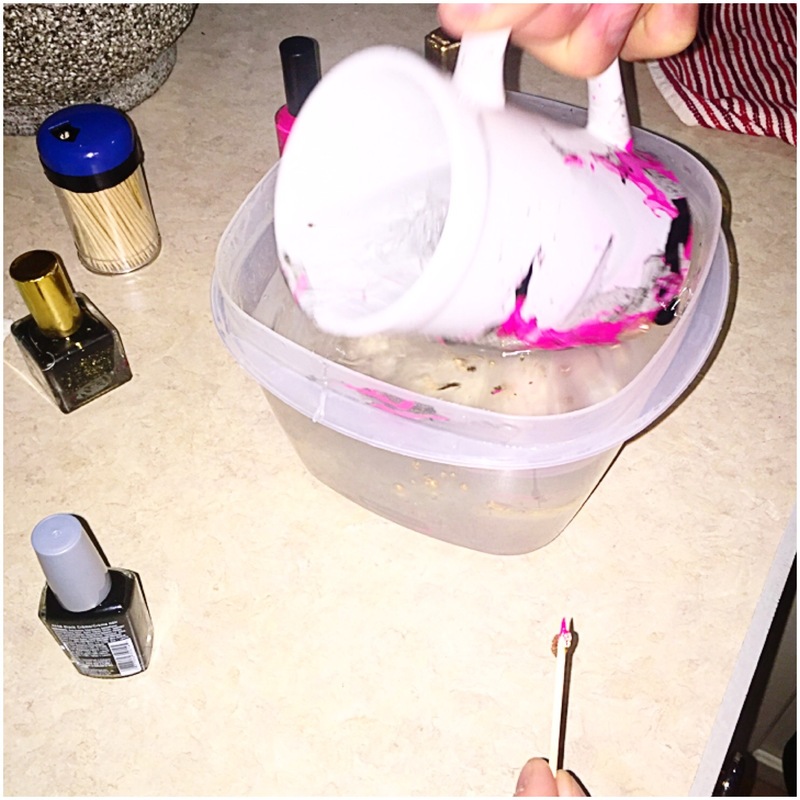 Dip your mug in the water and repeat until desired results! Some people said to use toothpicks to swirl the colors in the water..I didn’t actually use them. I liked the effect of just dropping in some colors and swirling others while I poured them. 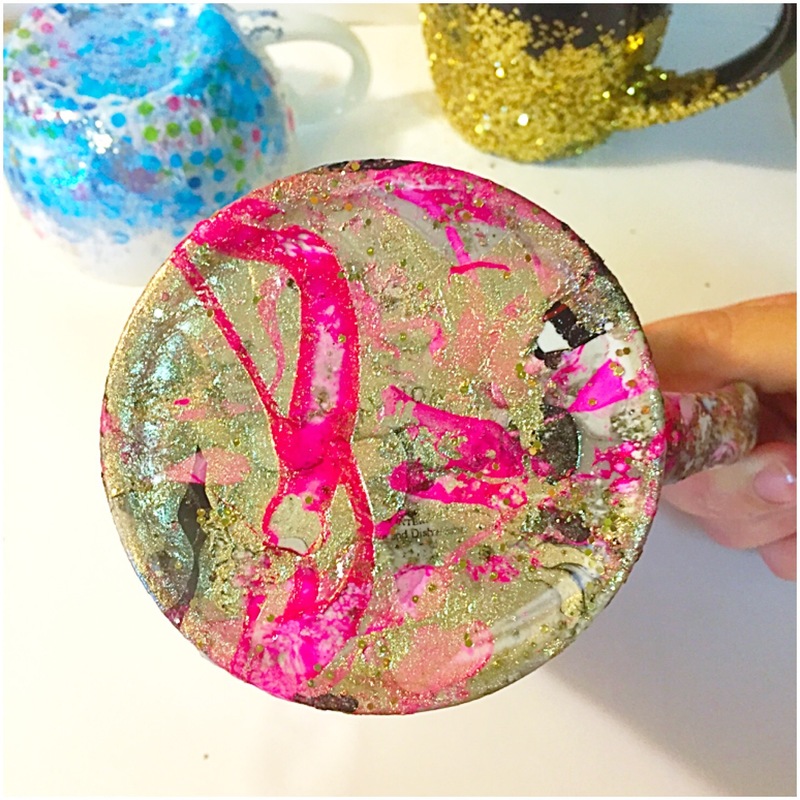 Once you have gotten the results you like, let dry and put on a coat of your dishwasher friendly Mod Podge to seal your art work for good. Although, hand washing I’m sure is best. This was my favorite to make. It was so easy! 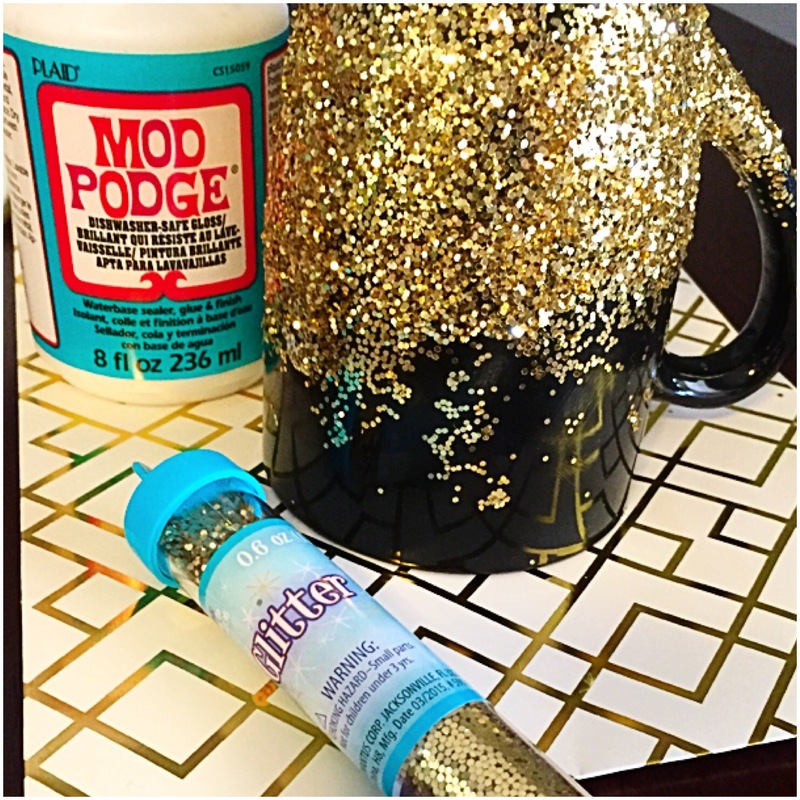 I didn’t tape off any fancy pattern or lines…just applied some Mod Podge and sprinkled on the Glitter. 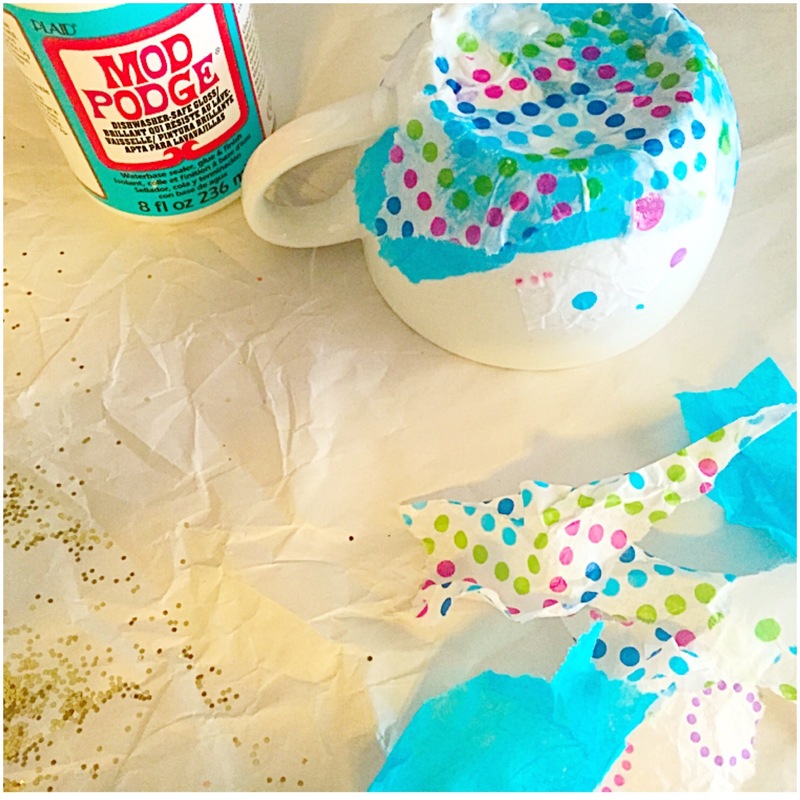 Apply first layer of Mod Podge and then cover with glitter immediately. Let it dry completely. I let it sit for about 10 then dabbed more sealant on the areas I wished to cover more, then applied another layer of glitter. 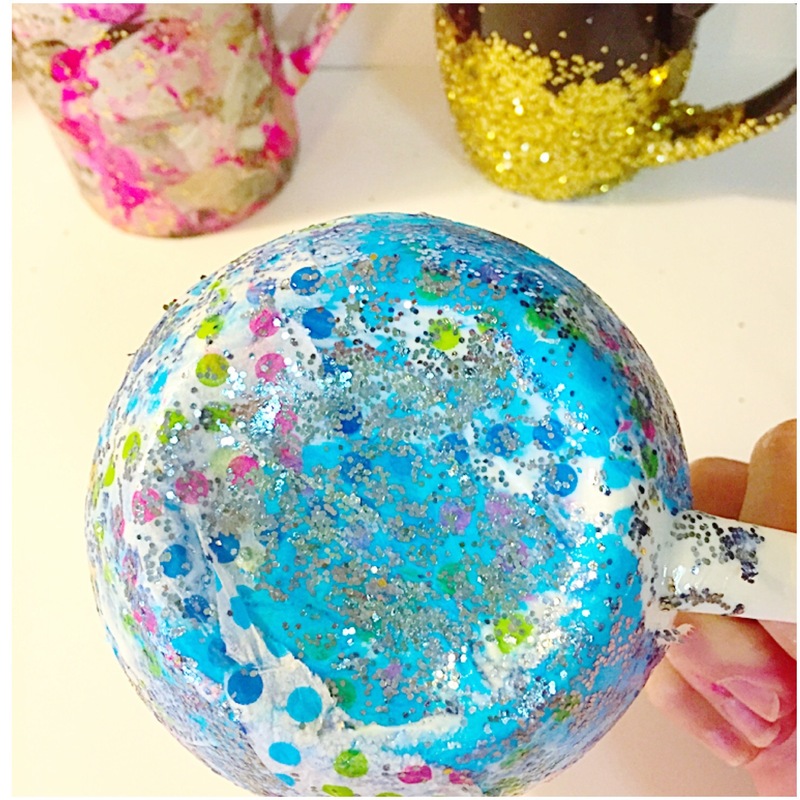 Let that dry for 24 hours before you do the last layer of Mod Podge to seal in the glitter for good and make it dishwasher friendly too. ***This needs to set for 28 days before can be used in dishwasher. 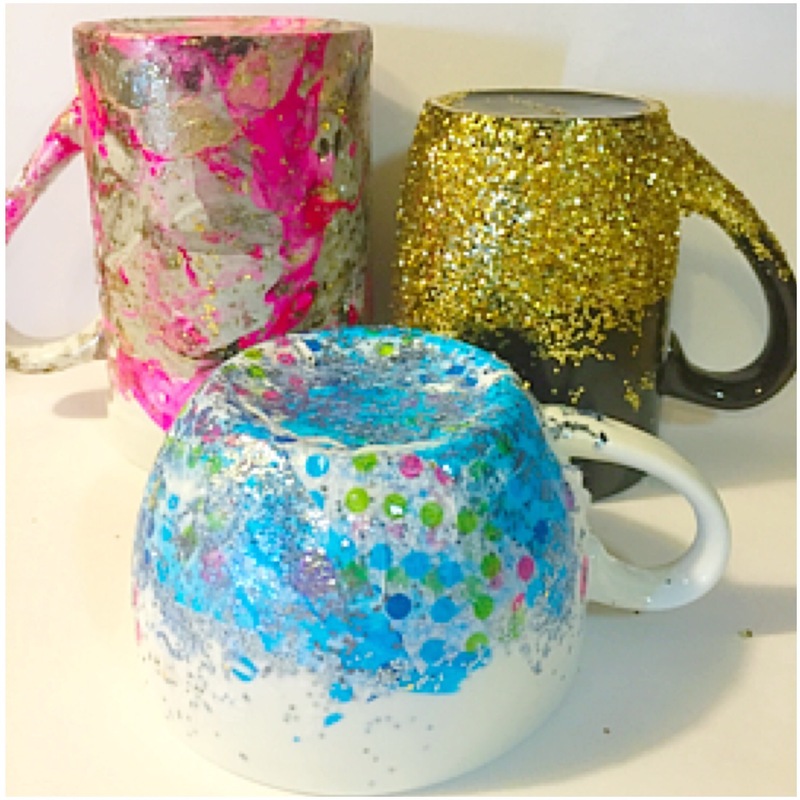 Use tape to make a perfect line or stickers to make patterns in the glitter. This was the trickiest! As you can see I had to rip some of the pieces off after I was done & go over it a few times, but it turned out super cute, in the end. 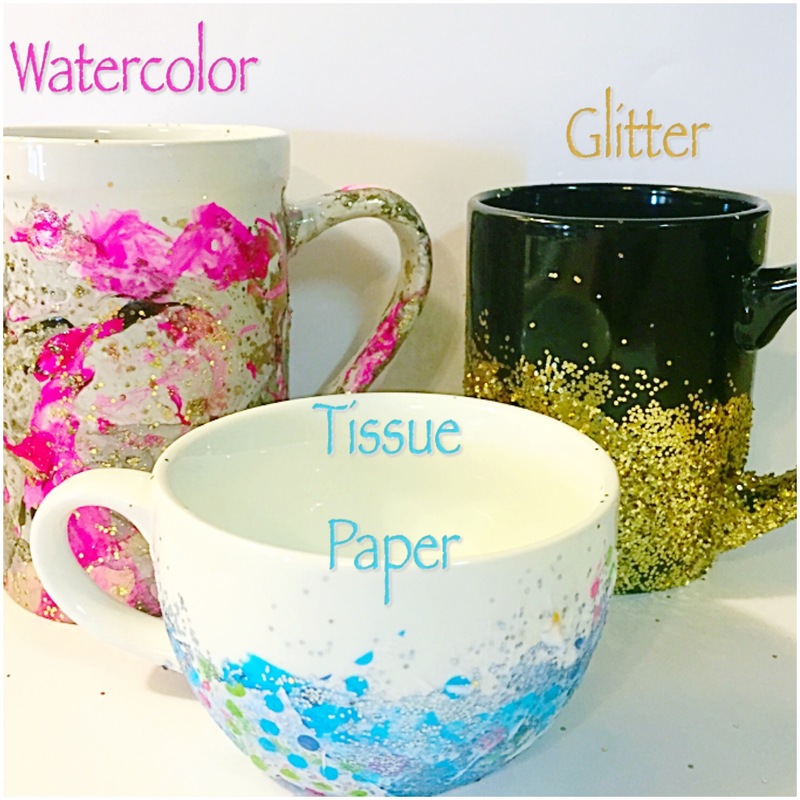 Rip tissue into pieces, cover your mug in a layer of the sealant and apply first layer of tissue paper. Seal with the Mod Podge again. Then apply more paper if needed. I sprinkled a layer of glitter on the last coat of Mod Podge to hide imperfections till I get this mastered. This is one I will definitely try again, using different patterns or mug colors till its perfected! 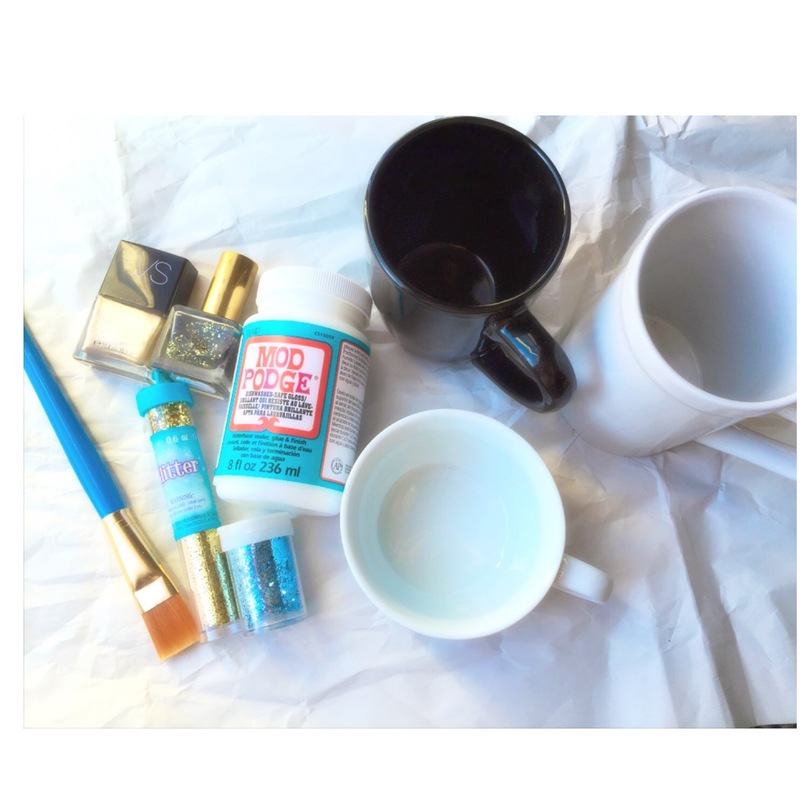 ***I’m letting all these dry over the next few weeks and be cleaned, since the Glitter Mug requires it anyway. So there you have it!! The kids loved all the art and I love my unique mugs. I’ll definitely be trying out different patterns and colors. This was great practice though. There’s a ton of ideas on Pinterest. So if you need more inspiration, pop on over and get started! I know I’ll be making some of these for the holidays and gifts!! Definitely a Pinterest success! I’d love to see if anyone has tried this too! Previous postThe Body Shop Sweet Lemon Scrub DIY Refill..